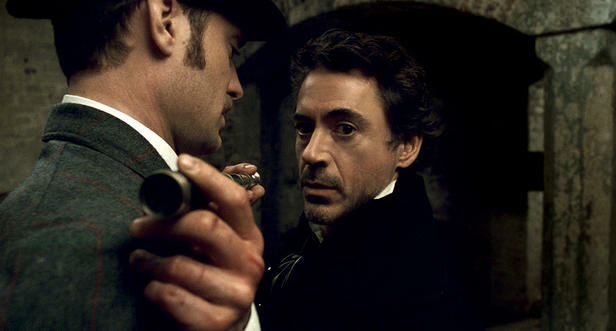 Law and Downey Jr. make like a couple of old marrieds (er, detectives) in Guy Ritchie's explosive "Sherlock Holmes." Whatever you think about Robert Downey Jr., you can’t accuse the actor of being a phone-it-in performer. He brings an edgy vulnerability to every character he plays. That goes triple for Sherlock Holmes, transformed in Guy Ritchie’s brutish but talkily charming “Sherlock Holmes” as a British Tyler Durden with wilder eyes, artfully disheveled hair and mind-boggling deductive powers. The bone-dry wit and the probing gazes, though, are vintage Downey, and yet they feel like something ripped from the pages of any Sir Arthur Conan Doyle’s short stories. Just as Downey — who at first seemed an odd pick (and a Yank, no less) to play the world’s most famous detective — puts his own stamp on the character, so too does Ritchie muscle in with his reinvisioning of Holmes and Watson. He’s out to recreate not just the detective and his obliging assistant but the entire world they inhabit. Though he’s not entirely successful (the dialogue isn’t period-specific; the special effects are anything but subtle), there’s one thing Ritchie has that keeps “Sherlock Holmes” bobbing and weaving like a boxer dodging the knockout blow: energy. What “Sherlock Holmes” the film lacks in brains it makes up for in zeal; this much is clear in the first 10 minutes, where Holmes and Dr. Watson (Jude Law) interrupt Lord Blackwood (the inherently menacing Mark Strong, who makes a first-rate villain), an occultist, in the midst of a human sacrifice. The scene involves Holmes unleashing a “Fight Club”-meets-blitzkrieg attack on the unsuspecting guard, but it’s an attack that’s planned with clinical precision and executed with supernatural calm. Downey Jr.’s Holmes is like that — an odd mix of brute strength (note his bulked-up physique) and spectacular observational powers. He’s an idiot savant with fists of fury. Not surprisingly, Holmes has zero social skills and cannot cope with change, which comes in form of Watson’s decision to leave 221B Baker Street and settle into marriage with Mary (Kelly Reilly). He’s tired, the good doctor insists, of Holmes’ poor hygiene, the grubby conditions of his study (Roger Ebert calls this an out-of-character misstep; I’d have to agree), his medical experiments on Watson’s dog. Quibbles aside, could Watson leave behind such a life of volatility? Is a lifetime of quietly retiring with a brandy before the study fireplace, pooch at his feet, really better than explosions and gunfights? Of course not, and the remainder of “Sherlock Holmes” proceeds to pummel us with the here’s why. There’s a plot thread involving thief Irene Adler (Rachel McAdams, criminally underused), that rare bird who has managed to outfox Holmes and steal his heart. She becomes entangled with Holmes and Watson’s mission to uncover what happened to Lord Blackwood. Properly hung, his body’s disappeared from its tomb (Holmes, naturally, won’t shrug that off as “black magic”) and the people connected to him suffer otherworldly deaths. Action sequences begat action sequences. And so on. While the fight sequences are expertly choreographed, even graceful, the special effects are disappointing — particularly the standoff on London’s Tower Bridge, which is … substandard. In these scenes, it’s as if Ritchie couldn’t find effects to match the vision in his head. The disparity is jarring. Other aspects of “Sherlock Holmes” feel the same way. McAdams, an extraordinarly versatile actress, is reduced to a few scenes that leave us wanting more (and not in a good way). Holmes and Watson, as Ritchie sees them, aren’t trusted colleagues so much as roommates who sort of have the hots for each other. The tweak makes the relationship seem phony, a bit cutesy and a little too bromance-circa-1891-London. Where’s the professionalism, the mannered decorum? Law and Downey Jr. work hard to make this update agreeable, and mostly they succeed. Their banter is amusing, but Law, ably playing the bemused straight man here, seems to understand he’s the opening act. As the headliner, Downey Jr. brings enough sarcasm and shrewd intellect to Sherlock Holmes to offset the washboard abs. He doesn’t merely play the character, he owns him, and that whole-hearted commitment nearly covers the film’s numerous shortcomings. “The Soloist” is a common tale of a decidedly uncommon friendship — that of homeless schizophrenic/brilliant cellist Nathaniel Ayers Jr. (Foxx) and the L.A. Times columnist, Stephen Lopez (Downey Jr.), who plucked him from slumdog obscurity. Ready to run screaming from the theater? Fight the urge, settle in and prepare to be wowed by two of the strongest performances captured on film in 2009 (and it’s only April). Where Susannah Grant’s screenplay and Joe Wright’s direction demand molasses, Downey and Foxx serve up weary self-awareness infused with much-needed bittersweet humor. Downey gets it right with Lopez, playing him as a glib opportunist who uses Ayers as fodder, then decides he’ll save him by moving him to LAMP, a nearby homeless shelter. Watch Downey closely as he drives up to LAMP’s outskirts and you can see those sanctimonious notions get crunched under the wheels of a skid-row crackhead’s shopping cart. That’s fitting, especially considering Downey doesn’t do warm and fuzzy; even when Lopez strikes a real bond with Ayers, there’s no schmaltz. Hooray for small miracles. That goes double for Foxx, who knows better than to re-enact “Rain Main” (perhaps he followed Col. Lincoln Osiris’ advice?). Here, he goes for understatement, which seems like a miracle in a movie helmed by a director hell-bent on drowning us in tragic-sounding symphonies paired with technicolor, self-consciously “artsy” cuts. Boo to that. There’s a meaty story here, and the real miracle is that Downey and Foxx find the rhythm to make that story as tart as it is believable.